Why Choose Laminate Flooring for your Home? Perhaps you had your heart set on installing solid hardwood floors. Then you began researching the cost involved, and it’s just not in the budget. Laminate flooring has the same aesthetic appeal as hardwood flooring but for a much more affordable price. Although nothing can quite emulate solid hardwood floors, laminate flooring in many cases is almost indistinguishable and it may be the perfect option for you. With laminate flooring, you can select from virtually any hardwood simulation, including texture, finish, the direction of the grain, and pattern. You can select a glossy finish, matte finish, or characterized finish where the surface looks distressed and is covered with natural-looking wormholes and imperfections. You’re not limited to the appearance of hardwood – laminate can resemble polished marble, timeworn slate, and even tile. 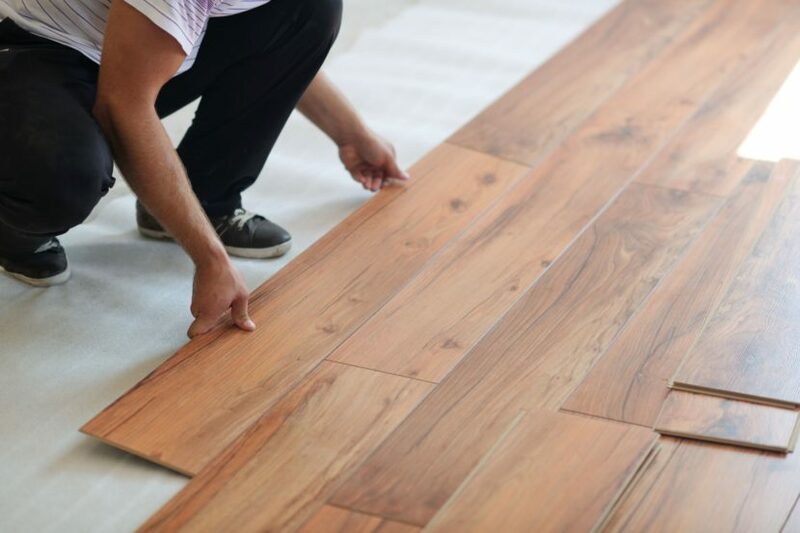 If you’re considering a DIY installation, laminate is very straight-forward. Most DIY-ers can finish a whole downstairs in just one day. You can purchase laminate in either squares (for emulating tile) or planks. The pieces come with a tongue-in-groove design, so most don’t need to be individually glued or nailed together. There’s no limit to pattern – you can install them herringbone, subway, or other. Each piece includes four layers of material: the top is a melamine wear layer; the second a high-resolution photo of the look you want; the third is a dense core board; and the fourth a melamine backing layer. Laminate flooring generally resists stains, dents, and the effects of heavy traffic. Moisture is only a problem if it’s not immediately wiped up. Water can seep between the laminate and damage the materials, so be sure to keep it dry as much as possible. If a spill occurs, wipe it up immediately. Take extra caution if installing laminate in high-moisture areas such as the kitchen or bathroom. Laminate requires little maintenance. Regular sweeping/vacuuming will safely remove surface dirt. If you decide to mop, use minimal water and wipe dry immediately afterward. Unlike hardwood flooring, laminate flooring doesn’t require resurfacing. Laminate flooring naturally resists mold and bacteria. You can purchase the flooring with allergenic coatings to further protect the health of your home’s residents. Are There Any Drawbacks to Laminate Flooring? The pattern is susceptible to repeating itself. Some homeowners don’t like the hollow sound when they walk on it since that is the most telling characteristic that it’s not solid hardwood. Since laminate cannot be resurfaced, the only option is to replace it once it gets a worn look. Some people don’t like walking on laminate because it feels hard and unyielding. Laminate, while a great alternative to hardwood flooring, will not last as long as hardwood. If you have any questions about laminate flooring, please contact us and we’d be happy to help!